I’ve been sifting through some archives, and have found some interesting little things that have been put in boxes to be covered in dust. This was a show to be aired on the discovery channel, I think you can figure out the vein in which it was meant to go. I’ve transcribed all the footage I found that had audio. My name is “none of your business”. I served in the elite AP classes. I’ve climbed on top of the school. And I’m an expert in surviving school. Today we’re going to be diving into one of the worst possible school situations: The Test. Now I’ve skipped breakfast and stayed up till six-thirty looking at the internet to start in the worst possible position. And I’m gonna teach YOU how to survive. I’m in the classroom. Now in these situations it’s best not to panic, you need to slowly take stock of your surroundings. The room is white, all the posters have been covered with paper to prevent cheating. There is someone chewing gum who really shouldn’t be. Almost everything is quiet, a bad sign, they’re afraid. Of what soon shows itself, the test is brought out, and electronic devices are taken up. This is the part it is most important to remain calm through, as some people have been known to have heart attacks or die of exhaustion after losing their electronics. It’s important that you keep your composure and not move to much during this process, struggling only drags you down deeper. 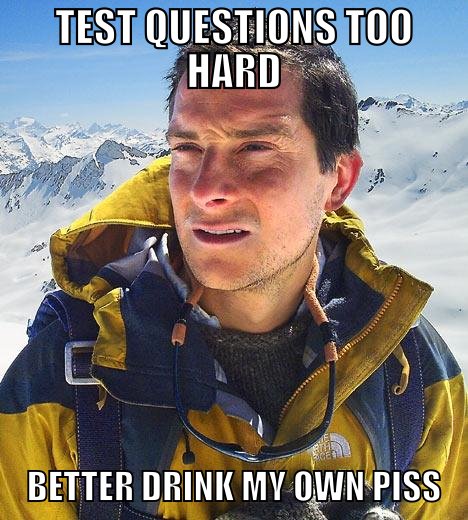 Now, during these tests you usually have luxuries, such as food, water, a pencil and so on. I’m forgoing these in order to show you how to truly survive. Remember to keep at a steady pace, don’t strain yourself, but don’t stop, or you risk not surviving. Everything should be smooth sailing in this part. Fatigue might start at this point. Consuming some supplies is recommend. Just remember, you might need more later. Remember, hallways can be a dangerous place, keep your eyes peeled, literally if you can. And always make as little noise as possible to avoid attracting the attention of predators. Hunger pings through me, I feel horrible, my pencil is making scratching noises, it’s driving me crazy, I’m not even sure I’m marking the correct answers. I’m so hungry I think I might die, my stomach feels like it’s dissolving itself. I started to try to eat my test, but stopped when I chewed off the answers. I set fire to my test and have it in the middle of my desk, I skinned my calculator and am roasting it on a spit I made out of pencils, I don’t think it will be enough to pull me through. Yeah, uh… we had to pull him out of there, please no one try this at home… it’s dangerous and you could end up like this poor young man… we’re, we’re pullin’ the plug on this one. The program wasn’t aired. The footage wasn’t even edited. It makes you wonder, don’t it. I have no idea why it was cancelled.